Newborns are routinely screened for their hearing shortly after birth to prevent delays in normal language skills. 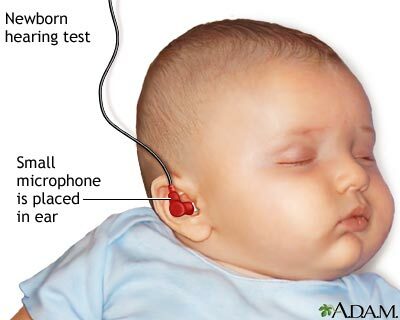 In one test, a small earpiece is placed in the outer part of the baby's ear. The earpiece emits clicking sounds into the baby's ear and the microphone in the earpiece detects nearby sounds. The sounds should echo in the ear canal. If there is no echo, it is a sign of hearing loss.